Not only have cane toads evolved rapidly; also, they have caused rapid evolution in native animals in the course of their Australian invasion. We know that toads kill lots of native predators that try to eat the toxic invaders, but cannot tolerate the toads’ poisons. Animals that try to eat big toads, like quolls and goannas, are in the biggest trouble (because big toads have a lot more poison than small toads. However, not every predator is equally vulnerable. Some are reluctant to try to eat toads; others are a bit more tolerant than usual of the toads’ poison, and so forth. In evolutionary biology jargon, this means that cane toads in Australia are a “selective pressure”. That is, the arrival of toads removes some genetic traits from the predator population (genes that make predators vulnerable to toads) but other traits (e.g., genes that tell the predator not to eat toads) are not affected. So, the toads cause a change in genetic composition of the predators: the only ones that survive are the ones that are able to live side-by-side with toads. 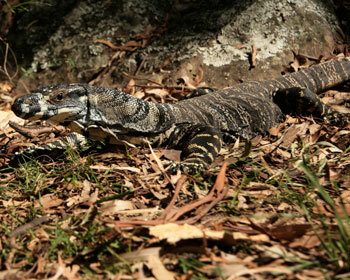 What kinds of characteristics would help a predator to survive after the cane toads arrive? The obvious characteristics would be genes that help predators ignore toads as food, and that allow predators to survive a dose of toad poison. But probably lots of characteristics might play a role … for example, any gene affecting where and when a predator is active (if it’s best not to overlap too much with toads) might help the predator to survive. Another “toad-smart” characteristic would be any gene that reduced the size of toads that a predator could eat – because smaller toads have much less poison than larger animals. 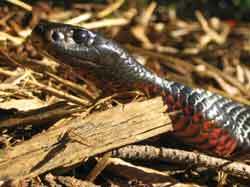 The best evidence on this evolutionary process comes from Dr Ben Phillips’ studies on red-bellied blacksnakes, a venomous snake species from eastern Australia. Ben looked at animals from Queensland (where the snakes lived in toad-infested areas) and New South Wales (where there are large areas where the snakes occur but toads do not – or at least, not yet). Ben found exactly the kinds of differences between snakes from toad-infested and non-infested areas that we would expect from evolutionary change. First, the snakes that lived with toads wouldn’t eat toads when we offered them to snakes in captivity, whereas when given the chance, about half of the snakes from toad-free areas readily grabbed a toad – and usually died as a result. 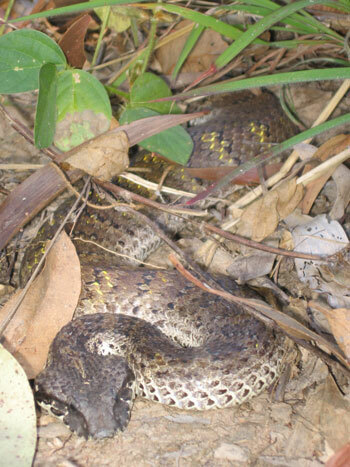 Second, the toad-exposed snakes were more able to deal with the toads’ poison. Third, the snakes from toad areas had smaller heads compared to their body size – so they were not able to eat really big (and thus, more dangerous) toads. The ability of native animals to evolve rapidly to deal with toads is a really encouraging result in terms of biodiversity and conservation. Toads haven’t driven any species to extinction – instead, they reduce predator numbers and change their characteristics. After some time (and we really don’t know how long), the predators are able to coexist with toads, and so their numbers begin to recover. Understanding exactly how native predators adapt to toads is a big part of TEAM BUFO’s program of research. We’re looking not only at Fogg Dam – for example, Matt Greenlees has examined how frog behaviour changes after toad invasion – but also in areas that were colonized by cane toads many years ago. John Llewelyn is based in Townsville, and he has worked out how the local snakes and marsupials react to toads, and how they can deal with the presence of this toxic frog-mimicking invader. Chris Jolly's work in northeastern New South Wales has given us a clear picture of how cane toad arrival in that part of the world affects native species. And in the KImberley region of Western Australia, Georgia Ward-Fear is studying - and testing ways to reduce - the toad's impact on goannas. One consequence of all of this research by TEAM BUFO is that cane toads in Australia have proved to be one of the best biological systems, anywhere in the world, for studies on rapid evolutionary change. Australian cane toads are now turning up in lots of textbooks of evolutionary biology! The Australian Research Council has given Rick a new Laureate Fellowship (from 2013 to 2018) to study toads from this perspective.